Grabbing the opportunity with both hands, Zenvo has exhibited its all-new Zenvo TSR-S Hypercar in the Geneva motor show. The Danish company had earlier hinted that the car would be showcased soon. 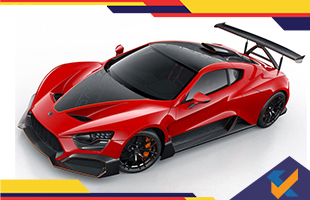 Based on earlier model TSR, the new Zenvo TSR-S Hypercar has been crafted especially for those who adore racing. As a matter of fact, the new and updated V8 engine has been installed in the car for the same purpose. Experts have appreciated the modifications that have been brought in the car and lauded the appealing design. The car comes with a V8 engine having the capacity of 5.8 liters. Coming on to the technical aspects of the car, the talking point has been the power of its engine. The new Zenvo TSR-S Hypercar has been equipped with an engine which can give up to 1177hp of power. The twin superchargers enable it to work with efficiency and reach the maximum level of its capacity. It is no surprise that the car reaches from 0 to 100 K/h in just 2.8 seconds. The makers have installed three settings for the engine namely maximum, minimum and autonomous. Talking about the settings that have been provided, the ‘maximum’ setting enables the car to reach the paramount of its horsepower. The minimum setting restricts the horsepower limit to the level of 700. The autonomous setting has been provided for a better control over the roads and enriching driving experience. The construction material of the body of Zenvo TSR-S includes aluminium chassis and carbon fibre body. Moving on to the design, the car has eagle eyes like headlights and a crouching lion inspired side-hunch designs. The car is weighted about1500 kg and has a seven-speed gearbox with paddle shift and straight gear functions. The important point to note is that the new Zenvo TSR-S Hypercar has been designed with precision. To maintain top speed and minimize resistance from the air, the car has been crafted aerodynamically. It aids the car in giving out higher speed with efficient performance. The top speed of the vehicle is about 325 K/h. The interior of the vehicle has been kept similar to any other sports vehicle. It features no air-conditioning or sound system inside. Rather the interiors have carbon seats installed along with six-point harnesses. The makers have not revealed the price yet but it is expected that the new and stylish car would cost around 11 crores INR.